This shows that tolyl thiolate (X=Na) reacts with the dichlorobutenone to give two substitution products in a 81:19 ratio. Singleton and Bogle argue that this arises from a single transition state, and that the two products arise from a statistical distribution of dynamic trajectories bifurcating out of a transition state favouring 2 over 3. Steve puts it very elegantly “I think most organic chemists hold dear to their hearts the notion that selectivity is due to crossing over different transition states“. When I read this, Occam’s razor came to mind: could a simpler (in this case a more conventional) answer in fact be better? My thoughts in fact followed a point I have been making here recently, the principle that modelling a complete system is probably better than a partial one. 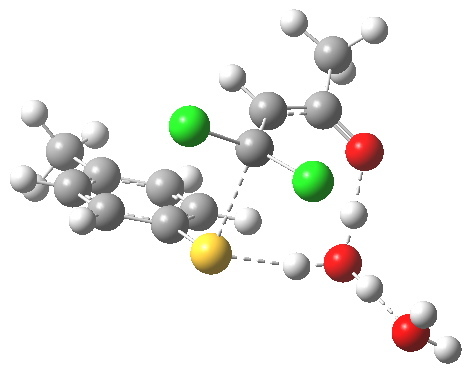 Now, if you look at Figure 1 of the Singleton/Bogle article, captioned “Qualitative energy surface for the reaction of 1 with sodium p-tolyl thiolate” I was struck by something missing; the sodium (X=Na), and possibly also explicit solvent (ethanol). I wanted to see if these missing components may influence the mechanism. The red arrows follow the proposed mechanism (a), whereas the blue arrows represent a more conventional 1,4-nucleophilic addition to form an intermediate enol anion, this then eliminating to the final product. Singleton & co. explored the potential energy surface using the following computational model: B3LYP/6-31+G(d,p)/PCM(ethanol) for the anionic system (defined by setting an overall charge of -1 during the calculation), finding the potential energy surface corresponded to path (a). They then went on to explore the dynamics of the system emerging out of this single TS, showing that in fact both products would be formed in more or less exactly the ratio observed. Two explicit solvent (water) molecules. A H+ (I will discuss Na+ in another post), attached to one of the water molecules as a hydronium ion. The hydronium ion bridges to the carbonyl group (this is the final optimised position; the second water molecule serves only to H-bond to the hydronium ion). This overall system is neutral, charge=0 (I like to say it might be found in a bottle or flask; pure anions of course cannot be bottled). The model used was B3LYP/6-31+G(d,p)/CPCM(ethanol); I find the CPCM method to be better for calculating intrinsic reaction coordinates (IRC). 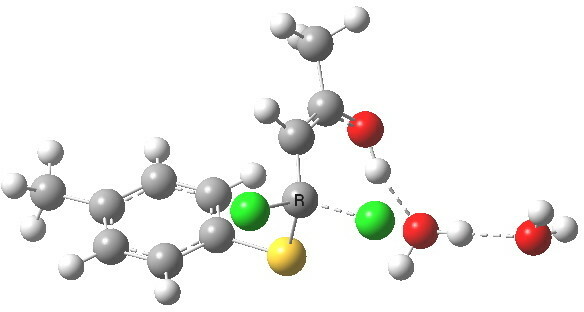 Using this transition state to initiate an IRC shows that the presence of this solvent bridge allows X (=H+) to smoothly transfer from sulfur to oxygen as part of a concerted process. This avoids excessive build up of charge separation. This now forms an intermediate (we are clearly following path (b) and not path (a) now). This is because the enolate anion is stabilised by protonation and a hydrogen bond from the proton to the solvent water, and so this becomes an explicit intermediate in the potential energy surface. This intermediate now collapses along path (b) to the final product, via the transition state shown below. 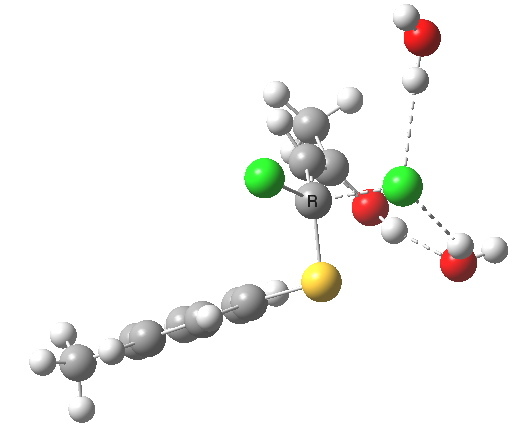 Again, an IRC shows a solvent bridge allows X to be concertedly transferred, this time from the oxygen to form hydronium chloride and 2 (I have not yet found the equivalent pathway to 3, but given the hydrogen bonds involved it is bound to be different). ΔG† (kcal/mol) along this sequence is 1 (0.0), TS1 (28.2), Int (8.0), TS2 (12.6); the intermediate existing only in a shallow well of 4.6 kcal/mol. The activation barrier is on the high side (the reaction occurs easily at room temperature), and it might be expected that (in part) this might be due to using X=H+ rather than X=Na+ for the model. Watch this space! What might we conclude from this? That the presence of additional molecules (H3O+ and H2O) can result in structures which can depend on other features of the molecule, in this case the carbonyl group, one that plays little role in mechanism (a). In path (b), the carbonyl group is far from passive, receiving and then releasing X during the course of the reaction. This must mean that the transition state for forming product 2 may indeed be a separate one from the transition state for forming product 3, since the relationship of these two to the carbonyl is different. To re-quote Steve again “I think most organic chemists hold dear to their hearts the notion that selectivity is due to crossing over different transition states”. Perhaps the explanation might indeed be due to different transition states rather than different dynamics? Clearly, more research needs to be done; I for one do not regard the case as closed on this example just yet. This entry was posted on Monday, July 16th, 2012 at 6:18 am and is filed under Interesting chemistry. You can follow any responses to this entry through the RSS 2.0 feed. You can leave a response, or trackback from your own site.